Students were given the opportunity to learn from the very best in the business as the first ever Telegraph Academy Day was held at Bangor University. Over 50 students took part in the five-hour training course which was designed to advise them on the best way to get a job in the media industry. 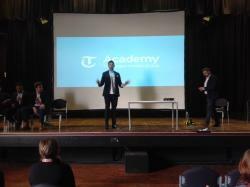 Students were taken through the Telegraph Media Day’s own recruitment process. This included workshops on video interviews, writing an eye-catching job application, and a full job interview. They were also serenaded by former X-Factor and The Voice contestant Sean Rumsey, who delivered a motivational talk. A video of his performance can be seen here. Second-year Journalism and Media student Zoe Milne enjoyed the academy day and said that she hoped similar opportunities would be available in future. “I really enjoyed it, and thought it was very useful and educational,” she said. Journalism lecturer Ifan Morgan Jones, who organised the day alongside the Telegraph Media Group, said that it had been a great success. “The Telegraph are at the cutting edge of their field so it was a great opportunity for the students to find out what skills they were looking for,” he said. “The students made a great impression on the Telegraph’s representatives – testament to their own hard work, and also hopefully the quality of the journalism and media course here at the university.